A patent is an industrial property title which gives its holder an exclusive right of use on the patented invention. This title has a limited duration, generally 20 years. Patents are only valid on a territory determined by their holder. In return, the invention is disclosed to the public 18 months after the patent is filed. The invention is then known by everyone, but it use is protected. The strategy chosen by REALCO to protect the fruits of its research is generally to file patents. In the water treatment sector, it is of value for new inventions developed from specifically selected enzymes and/or micro-organisms to be patented. Likewise for the detergent sector, the development of innovative formulations based on the mixing of raw materials (with greater effectiveness than existing products), makes this method of protection necessary. And this is despite the fact that this sector has a significant risk of prior art. A patent affords a highly significant competitive advantage, particularly in terms of formulation. Also, filing a patent allows Realco’s credibility to be reinforced. The removal of the inhibition of detergents on the bacteria thanks to the action of the enzymes. Using enzymes in cleaning therefore enables waste water purification results to be improved. The use of Realco’s enzyme-based products ensures better respect for the environment, by improving the biological treatment of waste water. 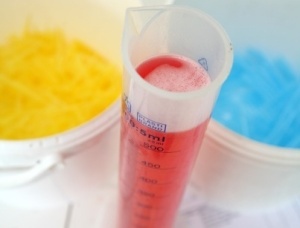 Detergent formulation combining enzymes and renewable raw materials (RRMs). Renewable raw materials, as opposed to petrochemical raw materials, are of a vegetable, animal or microbial origin. The value of their use is in contributing to sustainable development, by using renewable resources and not fossil fuel resources. Analysing the product’s life cycle consequently shows a much better balance in terms of CO2 emissions. REALCO has been able to show that the combination of these RRMs with the enzymes enables detergent products to be obtained with greater effectiveness than the equivalent products of a petrochemical origin or containing only RRMs, and the enzyme stability to be improved. Process limiting the development of certain plant diseases. This process, called Biophytomax, aims to limit the development of various plant diseases by inhibiting the extracellular enzymes produced by pathogenic micro-organisms. This treatment is intended to be more ecologically sound and more sustainable. Enzyme-based process, aimed at the total and lasting removal of biofilms. Use of enzymes in the pulp and paper manufacturing processes. The patent concerns the application of enzymes in the pulp and paper manufacturing processes, with the specific feature of being able to control the activity of the enzymes in these processes via a principle of reversible inhibition to order. The applications aimed at are saving energy (refining and drying), the characteristics of the paper and productivity through the machine’s improved output.